Data marts are no longer sufficient to meet the demands of a modern BI program. This post lays out a framework for delivering BI value in the modern era. The technologies and processes that help us deliver BI services have advanced by leaps and bounds over the last two decades. 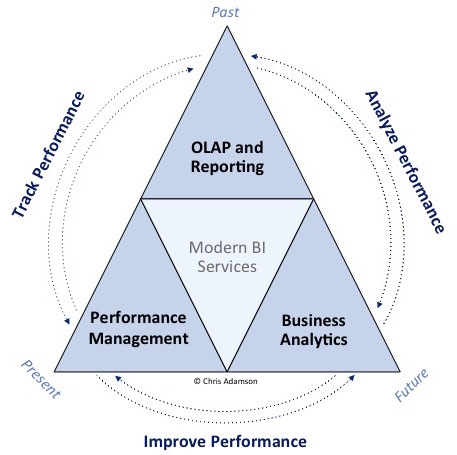 A modern BI program provides three perspectives on business performance, roughly corresponding to the past, present, and future. OLAP and reporting services (or simply "OLAP") provide the "official record" of what has happened in the past--the canonical log of business activity. Ad hoc query capabilities allow people to ask their own questions about the official record, even if a pre-defined report or analysis does not exist. The integrated record of business activities, aka "Data Marts." This record combines, standardizes and organizes information for business consumption. Essential in delivering the first three kinds of information products, this component was the primary focus in the early years of BI, when we called the practice "data warehousing." Since then, the discipline has changed and expanded. But it is still essential that the BI program provide the ability to understand the past. Performance management services provide real-time status on key performance indicators, as well as performance versus goals. KPI's and goals are carefully matched to the viewer's role and linked to business objectives. Goals communicate expectations, while KPI's communicate achievement of expectations. Information on dashboards and scorecards is carefully tailored for the user or functional area. Metrics are chosen for relevance and actionability, linked to business strategy, and balanced to reflect a holistic picture of performance. While this service area can stand on its own, performance management solutions are more powerful when people can dig into the KPI's on their dashboards. This capability is enabled by integrating performance management services with OLAP services. Analytic services probe deeply into data, providing insight into cause and effect, making predictions about what will happen in the future, and prescribing a course of action. Like the other pillars of modern BI, analytic services can exist alone but are more powerful in the presence of the other pillars. Prescriptive metrics, for example, are best presented directly on operational dashboards; useful analytic metrics can be recorded and tracked over time in data marts. In each area of the business, these capabilities should be balanced and tied together. Centralized management of all three pillars is not required, but they should be coordinated and integrated. A shared roadmap should lay out their planned evolution. Your objective is business impact, and my next post shows how these services deliver it. BI and the Path to Business Value (3/20/2015) explores how the three pillars of modern BI enable business impact. Business Intelligence in the Modern Era (9/8/2014) provides a definition of Business Intelligence for modern information assets. For more on managing the Modern BI program, check out Chris's latest course: Business Information and Modern BI. Check the sidebar for upcoming dates.